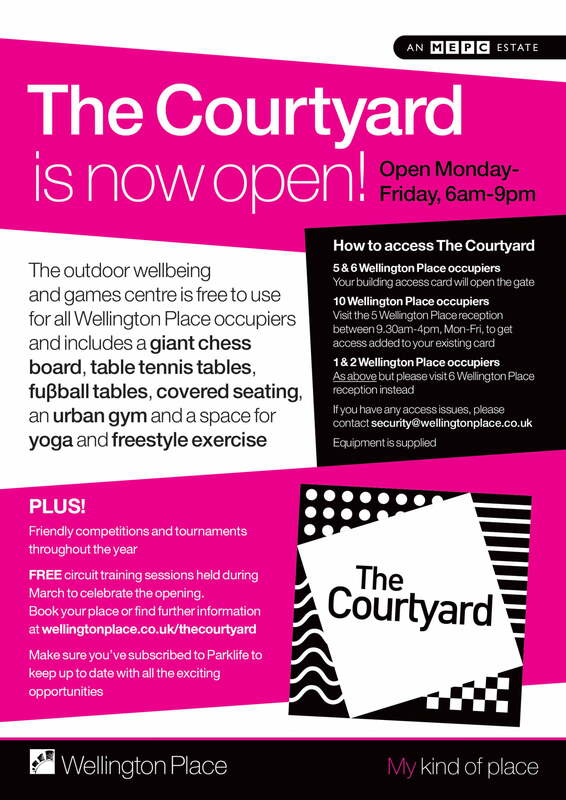 We’re delighted to announce that our new outdoor wellbeing centre, The Courtyard is now open Monday-Friday, between 6am and 9pm. The centre is free to use for all Wellington Place occupiers, and includes a giant chess board, table tennis tables, fuβball tables, covered seating, an urban gym and a space for yoga and freestyle exercise. Friendly competitions and tournaments will be run throughout the year, and in celebration of the opening, we’re giving you the chance to enjoy some free circuit training sessions during March. To book your place or for further information, CLICK HERE, and make sure you’ve subscribed to Parklife to keep up to date with all the exciting opportunities. If you work in 3, 5 & 6 Wellington Place your building access card will work to open the gate. If you work in 10 Wellington Place, please visit the 5 Wellington Place main reception between the hours of 9:30am and 4pm, Mon to Fri, to get an access chip added to your existing card. If you work in 1 & 2 Wellington Place please visit the 6 Wellington Place main reception between the hours of 9:30am and 4pm, Mon to Fri, to get an access chip added to your existing card. To view the conditions of use please click here.